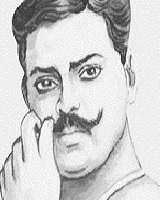 Chandra Shekhar Azad 23 July 1906 27 February 1931 Indian Sitaram Tiwari Jagrani Devi Revolutionary leader, freedom fighter, political activist A firebrand revolutionary, he engaged in a heroic battle against the British. His role was crucial in inspiring the others of his generation to participate in the national movement for freedom. A list of popular Hindi Chandra Shekhar Azad quotes are given below.